Each non-smoking room at the Fleetwood Inn Suites has a walk-out patio or second-floor balcony with superb views of Northern Michigan's Inland Waterway plus free Wi-Fi a microwave and a mini-fridge. Facing Northern Michigan's beautiful Inland Waterway the 42 non-smoking rooms at the two-story family-operated Fleetwood Inn include free Wi-Fi microwaves mini-fridges coffeemakers cable TV and â?? here's the best part â?? walk-out patios or second-floor balconies with splendid waterway views. Boat slips are available and continental breakfast is offered daily. Pets are welcome and parking is free. 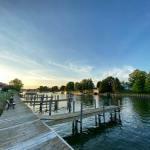 The Fleetwood Inn Suites is located 15 miles off I-75 at Exit 313 and is one mile from Lake Huron. It is situated directly on the Michigan Inland Waterway a spectacular 40-mile chain of lakes and rivers and 17 miles from the ferry docks for Mackinac Island itself a roughly 15-minute ferry trip away. Cheboygan Crib Lighthouse is within two miles and Cheboygan State Park is within seven miles. Pellston Regional Airport is 19 miles away.